Remington Core-Lokt – a reputation deserved. Hunters with a knack for filling their deer tag tend to have more than success in common. 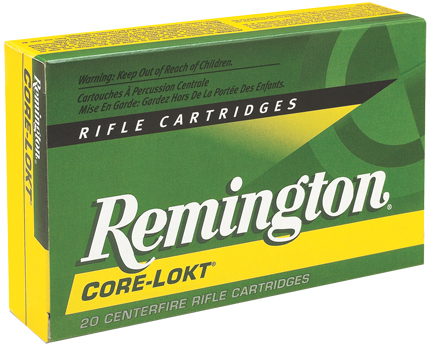 They trust their hunt to Remington Core-Lokt. For more than six decades, it has remained the leader in centerfire deer ammunition. And deservedly so. The Core-Lokt bullet design is the original controlled-expansion bullet – and one of the most effective ever developed. Its progressively tapered copper jacket is locked to a solid lead core, promoting perfectly controlled expansion and high weight retention for absolutely dependable on-game results. You’ll find its time-proven performance in both soft point and pointed soft point versions – and in a range of bullet weights for virtually every centerfire hunting caliber made.